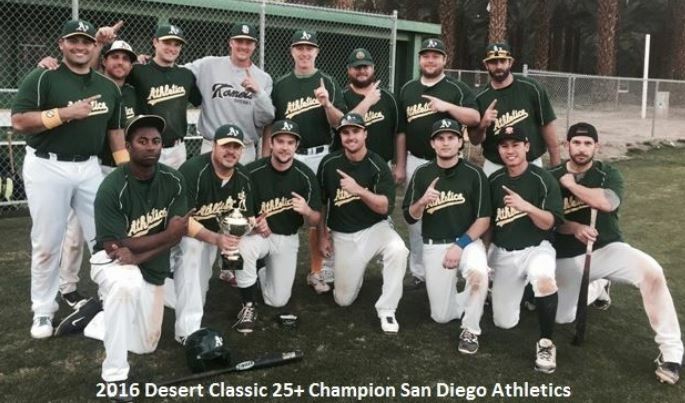 In an incredible match-up, the San Diego Athletics pulled out a nail-biting 5-4 championship victory in the bottom of the 12thinning over the So Cal Angels to win the 25-over division of the 2016 MSBL Desert Classic in Palm Springs, California. The Athletics are managed by Steven Woods. Cheyne Whitney dominated the game from the hill with a 12 inning complete game pitching performance, giving up only two earned runs while notching 14 strikeouts. Whitney also went 3-4 with a walk to help his own cause. Alex Renteria ignited the Athletics in the bottom of the ninth with a solo blast, bringing the Athletics to within one run. Alex finished 3 for 3 in the game to go along with two walks. The Athletics then continued the rally in the bottom of the ninth to tie the game. Both offenses were shut down in the early extra innings but the Athletics brought home the winning run with two outs in the bottom of the 12th as Jimmy Davis knocked in Mike Masaab on a close play at home from a bases loaded fielder’s choice for the walk-off championship victory. The Athletics went undefeated at 3-0 in the round-robin portion of the tourney and won their semi-final game 6-3 against Orca to advance to the showdown against the Angels. In that game, Steve Boggs led the team by going 2 for 3 with a double, an RBI, a walk and was also hit by a pitch. The Angels went 2-1 in round-robin and won their semi-final game 9-8 over the San Diego Knights, securing a berth in the championship game against the Athletics.